• which greatly reduce distortion due to high humidity and oiling. • pre-wound bobbins with plastic sides and core. bobbins with plastic sides and core. 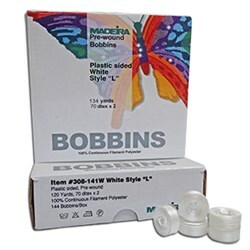 These plastic sided L bobbins are some of the best on the market! With superior strength they work in almost all machine.